Some days back I posted the article "Animated loading Effect for Blogger" through which you can make your Sidebar load with a cool effect by using some CSS codes. 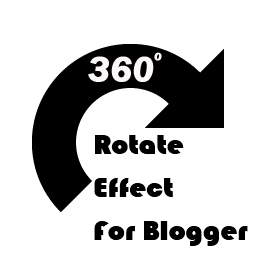 Today I will show how you can make your whole blog rotate 360 degree with a line of CSS code. After adding this effect all the pages of your blog will rotate just after the full loading of your blog. The live demo of this effect can be seen by clicking on the button below. To add this effect to your blog you don't have to follow different tedious steps just click the 1-Click Widget Install button and add this widget to your desired blog. After installing you and your visitors can see this cool rotating effect in your blog. NOTE : This effect works only in Google Chrome and Mozilla Firefox. Browsers like Internet Explorer and Opera are not supported. Is There A Way To Only Add This To The Home Page And Not On All Other Pages?